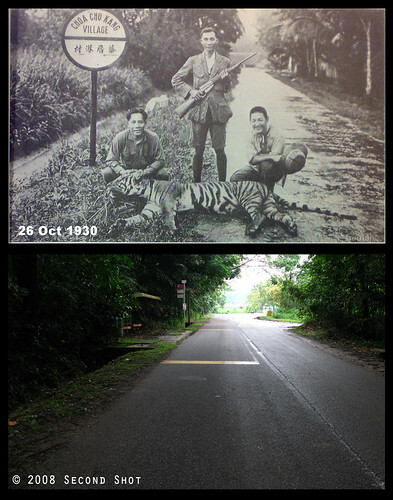 Since I was in school, this photo of a tiger and its hunters along a country road is a familiar one in textbooks and references on local history, used to illustrate the early days when Singapore was plagued by tiger menace. A signpost in the photo tells us it was taken at Choa Chu Kang Village. In fact if you step into Choa Chu Kang Library today, you can see it proudly displayed as a "pictorial artifact" of the new town (see here). Before the library was renovated it was displayed even more prominently, behind the information counter. After I started this blog, I took a closer look at the photo and asked myself - would I be able to do a second shot? Where possible, I try to make the second shot more exciting by finding out the background story. So let us rewind the clock back to 26 October 1930 when the photo was taken .... what did the media - English and Chinese newspapers - have to say about the tiger affair (not this)? 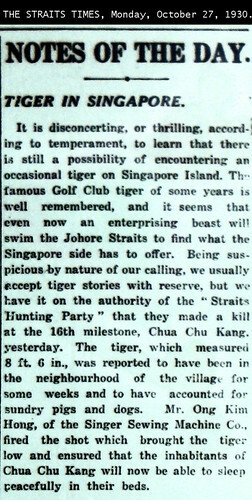 Note the pertinent information - the tiger was killed at 16th milestone, Chua Chu Kang, by a certain Mr Ong Kim Hong of Singer Sewing Machine Co. This article - 攻猎队奋勇除虎患- describes how the Straits Hunting Party (海峡攻猎队) tracked and shot the tiger. The hunter is not mentioned. Slightly more information than The Straits Times but unfortunately I could not make out some of the words after 80 years. There seems to be little journalistic integrity when it comes to facts for Nanyang Siang Pau. We are told Yio Chu Kang (杨厝港) was where the tiger was discovered and shot when it should be Choa Chu Kang (蔡厝港). Both Sin Chew Jit Poh and The Straits Times mention Choa Chu Kang as the location. How could the reporter mix up the two places, they are quite far apart! One glaring inconsistency in the article. We read the tiger as weighing 225 catty (二百二十五斤) in the title. At the end of the article, the tiger is described as weighing 250 catty (二百五十斤). What happened to the 25 catty? To add insult to injury, Sin Chew Jit Poh describes the tiger as weighing 213 catty (二百一三斤)! Looks like we should be wary of facts and figures coming from Nanyang Siang Pau. The article begins with the statement "15 miles away from downtown ...." (距离本坡十五英里). Accordingly, the tiger meance and shooting happened at 15th milestone Choa Chu Kang (never mind the Yio Chu Kang mix-up) but Sin Chew Jin Poh and Straits Times place them at 16th milestone (十六英里). Could this be another tiger menace at 15th milestone Yio Chu Kang, which will exonerate Nanyang Siang Pau from some of these errors? I don't think so. The hunter is mentioned - a Cantonese employee "Ah Hong" from Singer Sewing Co. (胜家公司职员亚康君，粤籍人). He should be that Mr Ong Kim Hong from Singer Sewing Machine Co. mentioned in The Straits Times. By the way, I don't think there was a 15th milestone Yio Chu Kang last time as the road was not that far away from town. One last puzzling thing. 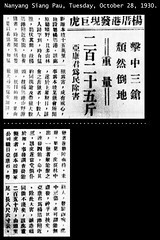 Both Chinese newspapers took two days to publish their article. The Straits Times only took 1 day. Any reason for the delay? 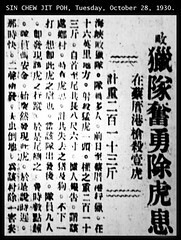 Nanyang Siang Pau was founded by Tan Kah Kee; in 1930 it was based in Singapore, as evident from the masthead (office at Robinson Road if I translate it correctly). From information gathered, the tiger was shot at 16th milestone Choa Chu Kang. Where is this place today? 16 miles = 25.7km. In some street directories today you can still find 26km Old Choa Chu Kang Road. Old in this case means 'original'. 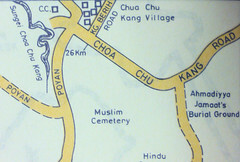 Old street directory showing Choa Chu Kang Village at Kg Berih Road (26 km Choa Chu Kang Road). 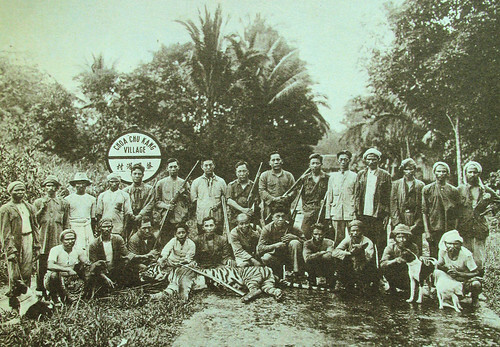 Note the Choa Chu Kang Village signpost in the 1930 tiger photo. Confident that I am on the right track, I alighted from a bus outside Tengah Airbase on one fine day and walked all the way to the end of Choa Chu Kang Road to capture my version of the 1930 tiger photo (along the way, I took this second shot and visited this cemetery). Old Choa Chu Kang Road. The last stretch before it ends at the National Shooting Centre. Somewhere along the road they took that tiger photo in 1930. Kg Berih Road. I think this leads to the old Kampong Berih off Lim Chu Kang Road. Choa Chu Kang Village would be on the left side? 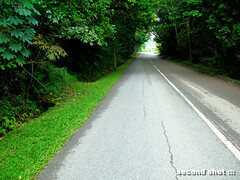 Jalan Sungei Poyan. Restricted access as it is now SAF training area. 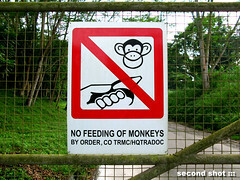 Monkeys around but I did not see any during my time training inside. 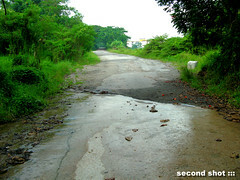 We used to travel along this stretch of Old Choa Chu Kang Road pretty often. The tonner would rumble along, with its truckload of sleeping soldiers, before a left turn into familiar territory (Jalan Sungei Poyan) - the ride would soon turn rocky and inevitably I would hear sombody break out, "wake up, wake up". Few hours (or few days) later, the tonner would exit with a right turn, rapidly picking up speed and with a gentle breeze, the bunch of us would doze off for the long journey back. It never occured to me then this was the place they shot the last tiger of Singapore. After 80 years the grass verge has shrunk due to road reclamation and the signpost is gone along with Choa Chu Kang Village. The position of the trio with the dead tiger should be about there, unless new evidence surfaces or somebody recalls where that village signpost was located exactly …. * Both tiger photos were donated by Tony Tan Tuan Khoon to the archives. In the photo with the trio, hunter Mr Ong Kim Hong is standing holding his rifle, president of Straits Hunting Party Mr Low Peng Hee is squatting on the right. Tony's grandfather is Mr Tan Tian Quee, vice-president of the hunting party. I enjoyed reading this post because it was relatively easy to follow compared to some of your other posts. As it turns, out this one seems to be easier than some of your earlier projects; such as the Bugis St toilet project. I think its becos of the photos and the mention of the 16 ms in the Strait Times article. I checked my 1963 st directory and your location of the 16 ms was spot on. Also, a few hundred metres down, the road ends at Choa Chu Kang Village. Hey next time you go on one of these expeditions, let me know and I will be your driver. In fact last year, I went to recce this area (by car) and was disappointed to find that a lot of construction was going on. Surprised to see in your photo that there is still a bus stop there. Wonder how the driver makes a U-turn becos I had some difficulty doing it with my Toyota Wish. Oh no, I wonder what they are constructing now. My photo was taken in 2008. The U-turn can be done at the shooting club driveway? That very famous picture of the last tiger shot in S'pore appeared in many books I've read. And often I had wondered where exactly was that location while scrutinising the photo closely with my magnifier. In the 60's, I've hiked and explored that area a lot of times. That would be only 30 odd years after the snapshot. And it was then still very "ulu"...much like the original pic image. Now, the mystery is solved! Thanks to your effort and determination. Who has the tiger and the rifle now? Unk Dicko, you should be familiar with CCK Village, its signpost is shown in the photo. If somebody can tell me where that signpost was located in relation to Kg Berih Road or the bustop, then the second shot will be more accurate. I also wonder who has the tiger skin now. Will be spectacular if one hangs the skin with the triumphant photo on the wall. Hi, have you used the historical imagery function on Google Earth, over the Track 22 area? I was surprised to see a sprawling kampong as late as 2005! By 2006 the structures were gone, and by 2008 nature had obscured most traces. Do you know if this was an occupied kampong? If you mean Track 22 near Old Jurong Road, I have not seen any kampong from my NS years from 2000 till now. That is very odd. Allow me to post this time series using Google Earth's historical imagery slider, showing the kampong being swallowed up by nature. It appears to be a kampong, though it was less likely but also possibly a junkyard or construction contractor's site. Hi I wonder if the parapet just behind the signpost would be an added clue to locate the site along the road? Hi Theotherme, good point. Unfortunately the parapet could have been removed during construction of bus stop. The best clue would be the signpost - old timers might remember its exact location in relation to the bus stop. Thanks J for pointing out the "kampong". Hmm, this needs further investigation. How can we find out what happened to the tiger skin? Good question by Anon. I guess one way to tackle the question is to interview descendants of the original hunting party. Anyone? Thank you for a fantastically informative post! What is the plaque commemorating the last tiger in front of Raffles Hotel then? I used to live in Kg Berih in 1980s. The map is correct; that place was 'Choa Chu Kang Village'. The 16 mile should be further up, a few more hundred meters before the bus stop. The Kg Berih was at 16.5 mile. Tanvi, I think there is no official plaque for the Raffles Hotel tiger though it is mentioned in passing on some of the plaques in the hotel. Anon, few more hundred meters before the bus stop ... do you mean after the bus stop in my photo? Kg Berih must be at end of road then. Icemoon,the bus stop is just before the Kg Berih Road. Back then, we refered this whole area as "16.5th mile". So, 16th mile should just be further along the straight road down old Choa Chu Kang Rd(towards town). Kg Berih is on the left of Kg Berih Road. On the right was old Chinese cemetery. Hi Icemoon, I remember taking bus 206 that ply between my place at Lor Jerun at LCK and Boon Lay (the small terminal is at LCK Rd End) in the late 80s. Near the end of old CCK Rd, it makes a 3 point turn at the junction with Kp Berih Rd, if I'm not wrong.